To assist women in West African nation of Sierra Leone, where some must walk miles to find clean drinking water for their families, Latter-day Saints have helped create community wells. 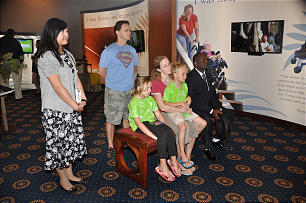 Stories about the Church's worldwide humanitarian efforts, such as that in Sierra Leone, along with suggested ways that individuals can make service a part of their daily lives, are highlighted in "Love Thy Neighbor," an exhibit on display at the Los Angeles and Washington D.C. Temple Visitors Centers. The exhibit is a series of photographs and short films that give examples of the Church's outreach to the poor and needy while also encouraging visitors to follow counsel recorded in the book of Luke in the New Testament to go and do likewise. The Los Angeles exhibit opened in August 2010 and will remain there permanently, while the one in Washington D.C. is a traveling exhibit that will rotate to another visitors center after October. "Thou shalt love the Lord thy God with all thy heart, and with all thy soul, and with all thy mind" (Matthew 22:37). "Thou shalt love thy neighbor as thyself. (Matthew 22:39).